Definition: The A-List in Asset Tracking Index includes companies providing products and services to support the fixed and mobile tracking of assets including products, parts, equipment in the supply chain. This may include the use of GPS, RFID tags, BLE (bluetooth low energy) Beacons, and barcode system technology to track, trace, and locate assets as well as provide onboard intelligence and sensor data. Assets range from small business assets to high value assets such as farming equipment and shipping containers. This index excludes fleet management and tracking, as this is included in a separate index with more in depth coverage. 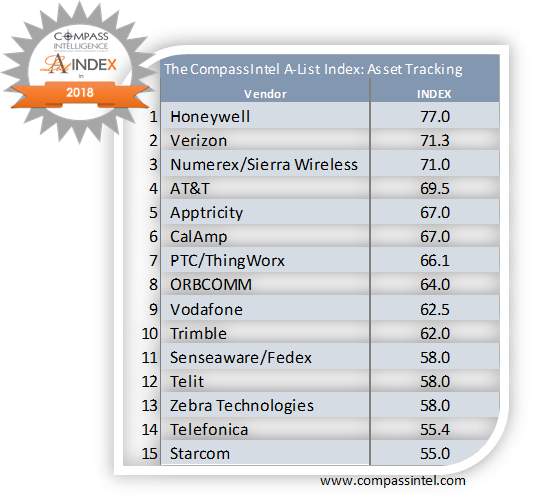 Introduction: Honeywell, Verizon, and Numerex top the CompassIntel A-List in Asset Tracking list, all with scores of over 70 points out of 100. The A-List in Asset Tracking Index includes companies providing products and services to support the fixed and mobile tracking of assets including products, parts, equipment in the supply chain. This may include the use of GPS, RFID tags, BLE (bluetooth low energy) beacons, and barcode system technology to track, trace, and locate assets as well as provide onboard intelligence and sensor data. Assets range from small business assets to high value assets such as farming equipment and shipping containers. There are more than 700 companies providing asset tracking and monitoring services and products including equipment/hardware, software/applications, platform, and services. This research and the framework was completed by Stephanie Atkinson. A total of 25 companies were included in the final ranking of this research framework, with over 40 companies evaluated. The final list includes 25 top ranked companies, along with 4 identified as being on the "Asset Tracking Watchlist". Logos owned by companies included in this research. Please fill out the below form to get access to the complimentary Executive Brief.